"The Bot" / "The Cartoon"
Wander Over Yonder is many things, but its animation has always been its primary selling point. It knows full well the scope and depth of its visual acumen, and will push it in different, unique, marvelous ways. Its secret, though, has been to tweak and tailor small changes to emphasize a particular style, reference, or idea: like “The Gift 2: The Giftening” throwing back to Tex Avery-levels of insanity, or “The New Toy” mimicking the modern take on the “two-and-a-half-D” toy commercial. When it needs to, the animation will step up to the plate, but it also knows when to step back, letting another aspect of the story stand out, and last night they did just that. Twice. Animation commentary is the main purpose of this episode, symbolized through the theatrical presentation, but also through some smaller details, some more obvious than others. The obvious one, of course, is when Hater says, “Animation is hard! People who do this for a living deserve more credit and respect,” punctuated by a nice, awkward silence right after. There’s also the classic trend of a number of cartoons from the 1970s and 1980s that inevitably led to the bland lesson of friendship saving the day, which is the show itself basking in its own vicious irony. 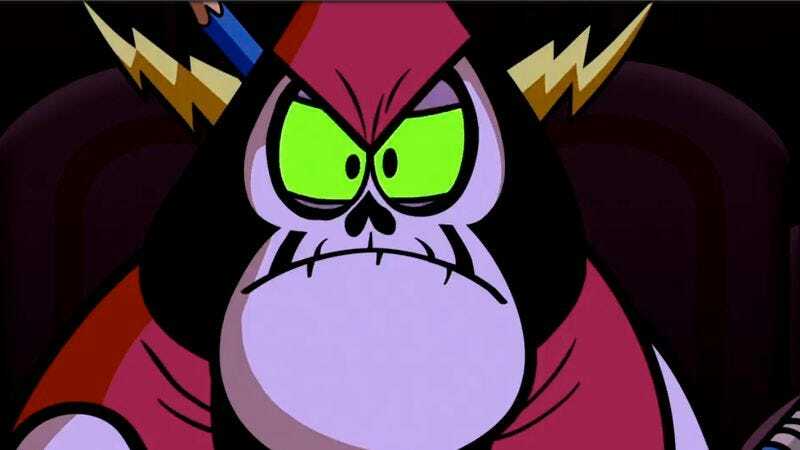 Wander Over Yonder is basically that kind of show–emphatically about the power of friendship and positive thinking overcoming evil or negativity–but doesn’t pretend that it’s simple, immediate, or valid in every case. That point is symbolized when the fake cartoon invokes its “twist,” where Hater comes nearly close to destroying Wander–only for Hater himself to once again ruin it due to his ego. This is also represented in the end tag, usually reserved to re-emphasize the episode’s lesson: here, Sylvia rightly dismisses Wander’s “lessons,” leaving him to latch onto some nonsense about bicycle safety. Wander Over Yonder, despite being a cartoon, approaches “friendship” rooted in realistic thinking: it’s important, but sometimes, it may not be the answer. In fact, the price of friendship can be downright tragic. “The Bot” tells a fairly simple story that we’ve all seen before, but it’s told beautifully, in classic Wander style. When I mention the animation for this episode being limited, what I really mean is that the animation is more “restrained,” especially compared to last week. The animation is still good–I particularly love the “fake-Rotoscope” walk cycle of the below screenshot–but it’s clearly held back to emphasize the story. Even the jokes aren’t that strong. It plays with our general understanding of the ideas of robots being unable to feel, adds a touch of Wander’s addictive friendship magic, and then painfully snatches it away. Dominator (who shows a bit more personality here: goofy, but completely no-nonsense) sends out her most respected Bot, Bot-13, out to find a planet to dominate for Volcanium. Heading to a world that’s backgrounded by a visual and musical 1960s beach-musical aesthetic, Bot-13, with its subtle foreshadowing within its designated number, meets Wander, who befriends him in his overly silly and aggressive way. The bot doesn’t want anything to do with the traveling alien, trying to escape and mostly being forced into Wander’s friendship games. It doesn’t seem like the bot is growing too emotionally attached to Wander up until it’s time for it to present the planet’s location to Dominator, information he deletes after going through a collage of those warm memories with his traveling pal. To which Dominator tosses him out. There’s a distinct coldness to how Dominator does this. There’s no real emotional build-up; it’s a straight-up beat down, followed by a casual ejection into the depth of space. The key to making tragedy work is by presenting a plausible escape, and it’s conceivable the bot could safely float out in space (like Wheatly) and, perhaps, see Wander again. Instead, we watch him slowly burning up in the atmosphere, eyeing the half of those photo booth pictures Wander gave him as a final farewell. It’s a small but powerful moment, made all the more poignant with the knowledge that Wander and Sylvia will never really know what happened to him. Wander’s friendliness is contagious, something that we’ve learned many times in the past, but here, there’s a sacrificial consequence to it, especially up against a force that absolutely won’t tolerate it. It seems that we’ll soon see Wander’s affections go up against Dominator’s unmoving sensibility, but the path there left one figure destroyed in the process. Positivity is necessary, but it isn’t easy. Good luck, fellow Beep-Boops. Jon Hamm doesn’t make much of an impression as the fake animated Hater, but just the fact that he did it is good enough for me. A little jab at “Brony Con” with the equally silly “Boney Con” reference there.